The last time I was trying to lose weight, the one dinner that I missed the most was Lasagna. I was lucky to find, and adapt, this incredibly, tasty AND healthy version that is quick to put together. You can simply leave the lasagna to cook in your crock pot while you do other things around the house. 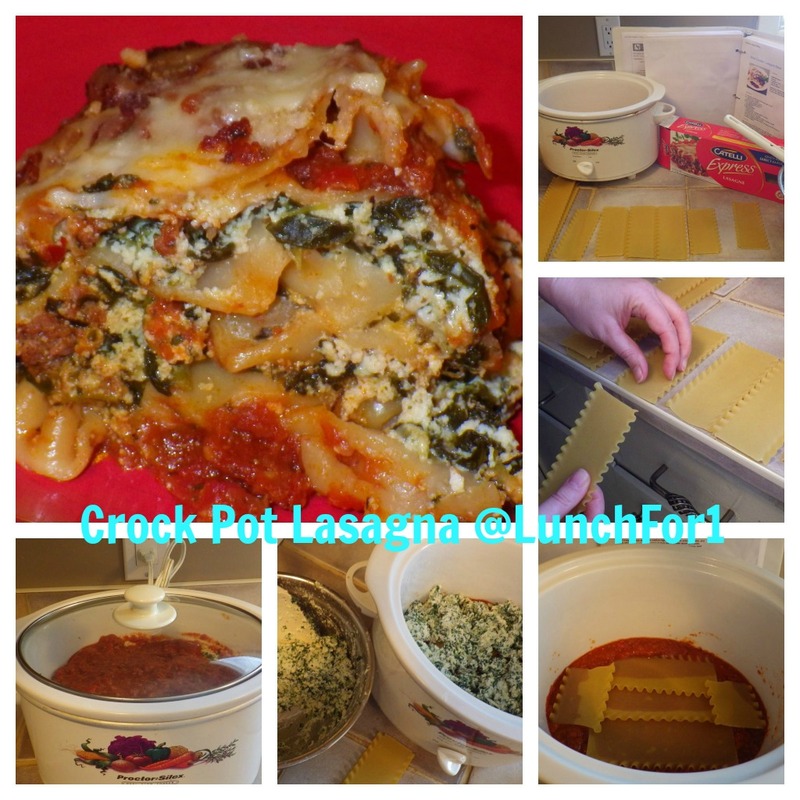 It makes a great dinner, and as with all Lasagna recipes… it makes an even better lunch! 1. Brown ground beef, onions and garlic with seasonings on stove in pot large enough to accommodate all the sauce ingredients. To save time on this step I just use 3-4 cups of my usual spaghetti sauce from the freezer. 2. Once the meat is cooked, add the crushed tomatoes and tomato sauce (and optional vegetables). Simmer for 5 minutes. 3. Mix the thoroughly drained spinach with ricotta and 1 cup of the shredded mozzarella in a bowl. 4. Snap your lasagna noodles in half (depending on the size of your crock pot) using the edge of your counter, as shown. 5. Place 1/3 of the meat mixture in the bottom of your crock pot. Then layer 1/2 of the cheese mixture on top. Lay 4 lasagna noodles on the cheese mixture, and repeat all layers one more time. 6. Place the crock pot cover on top, and turn your crock pot on low for 4 to 6 hours. 7. Just prior to serving, turn off your crock pot. Mix 1/2 cup parmesan with 1/2 cup mozzarella, and add to your Lasagna as topping, and let melt for 10 minutes. What is the secret ingredient in favourite Lasagna recipe? Please feel free to share your tips in the Comments section below.